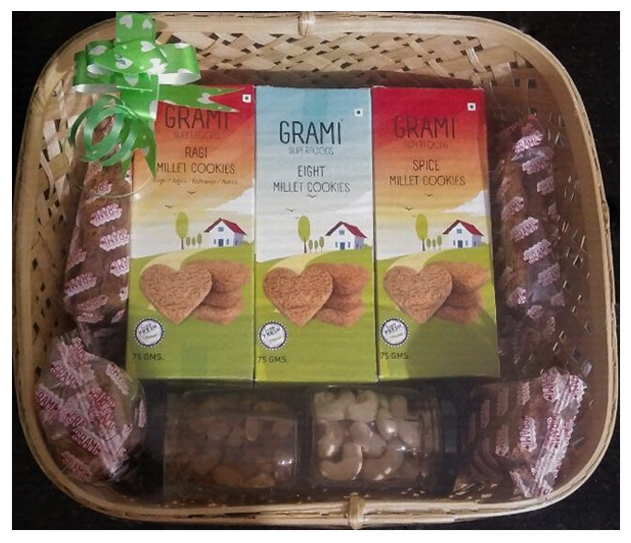 Yummy hamper of Ragi millet, 8 millet and Spice millet cookies (75g pack, one each) along with healthy dry fruits like Cashews and Raisins. 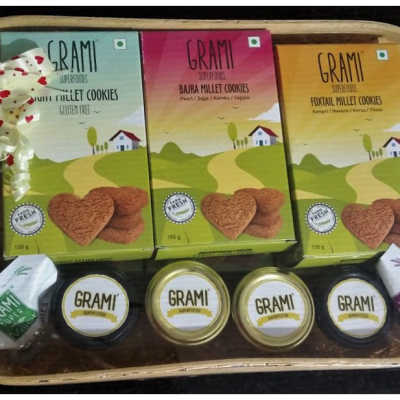 This year, Grami Super foods have kept the conditions of the suffering of millet farmers in their mind and have introduced a wide new range of Diwali hampers. Our hampers would be bamboo baskets made by the Tripura weavers to help them promote their business. These baskets are filled with our super nutritious millet cookies and are a very unique and healthy gift for all who want to ensure good health if their near and dear ones. So friends, this Diwali instead of brightening only the conditions of poor families, help us to make the Bamboo weavers happy and brighten their Diwali by opting for this basket of super healthy millet cookies. We thank all of you from the core of our hearts for choosing us and our unique endeavour. This way instead of sending Mithai boxes you are not only ensuring the needy Tripura bamboo weavers and the extremely poor millet farmers some good help but you are also helping your closed ones to choose a healthy way of life instead.